As the former director of the stained glass apprenticeship program for City Colleges of Chicago, I was always looking for better ways to do things for both our students and client glass company sponsors. In doing some mosaic projects, there were complaints on the glue that was being used to glue glass to glass. Some complained about the fumes, others about the implied toxicity in getting the glue on their fingers during the cementing process. As a result, I embarked on an "informal" research project to learn if there was a "better" glue out there that would do the job with a minimum of risks. Toward that end, my assistant and I, set up five criteria: Toxicity/Fumes, Hold, Flow, Clarity, Clean up, (during and after cementing). I contacted 12 companies and asked them to submit samples of their products. Everyone responded with two exceptions. My assistant and I ran three different gluing tests: cathedral glass to plate glass; frit to glass; opalescent flesh colored glass to plate glass. The following are the glues in order, from least desirable (1) to best (10) based on a score of 1 to 10. Again, I must caution that this is the result of a very biased sample of two people testing 10 glues. In summary, Bond 527 was the best holding and clearest glue but was the most toxic. Squeeze-N-Calk and Weldbond were near the top due to having the least harmful fumes and great cleanup. Weldbond took top honors because of it's better holding ability. I would also like to thank all the companies that were kind enough to supply me samples to make these "unscientific" (but important) tests. If you have any questions or comments, contact David L. Ward, dward@wardmosaic.com; www.wardmosaic.com; 773-929-3993. Or write to him at David L. Ward & Associates, Inc., 360 W. Wellington, Suite 12A, Chicago, IL 60657-5631. A two-day workshop in mosaic glass as an art form can be customized to fit your needs as an individual, retail store, or educational institution. by David L. Ward, Ph.D.
Have you ever wanted to make a beautiful glass mosaic art picture, something to proudly display in your home on the wall, in the window, or on your table to the admiring glances of your friends and family? Have you felt that this is for artists only? Well, now is your chance to become that artist! Creating beautiful clear glass mosaics is a lot of fun, and easier than you think. The instructor will show you how as he shares secrets he has learned from his apprenticeship with Italian and Russian glass artisans. He will help you pick the glass, cut, fit, and make your glass project "come alive!" Working from patterns (the instructor's or yours), you will learn the basic steps of cutting small glass pieces, gluing them onto glass (not wood or board), for a magnificent translucent effect. You can make gorgeous abstract designs, or lush forests with foliage and sky backgrounds, or portraits. 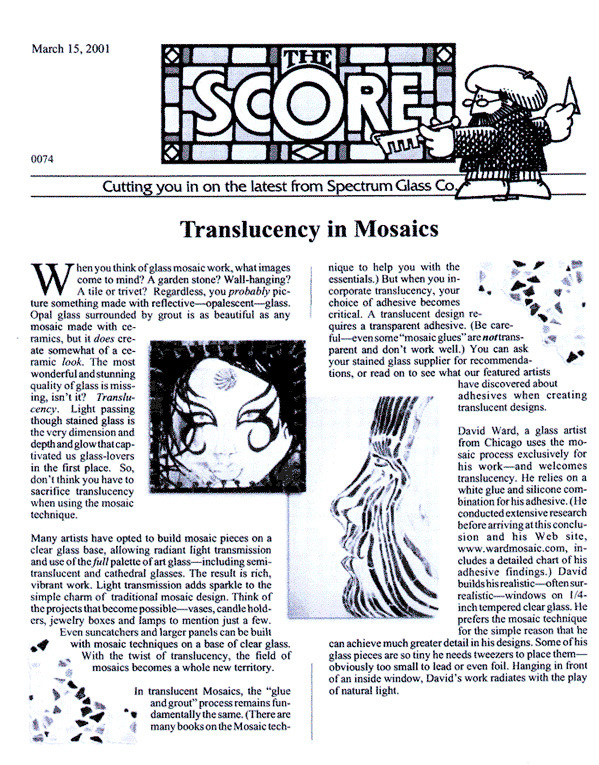 Unlike traditional stained glass, you are not limited to lead lines or the copper foil method. You can create your own lines and shadows. Join us for an exciting hands-on Mosaic Glass Art Workshop (not a "how to make stepping stones for the garden" type-class), customized for a beginner or person with limited or no experience who wants to do something "totally different!" Don't worry about making mistakes. If needed, the instructor excels in hand-holding and stroking. The class is fun, informative, and fun. Class size is extremely limited. First come, first served. Tools and material are extra. &COPY;Copyright by David L. Ward & Associates, Inc.
E-Mail: dward@wardmosaic.com. No portion of this material may be reproduced in any manner whatsoever without the express written consent of the copyright holder.